“Maggi,” that one word is enough to make us nostalgic, and usually, also make our mouths water. Maggi has become synonymous with instant noodles, mostly because it wasn’t until fairly recently that other instant noodles brands such as Ching’s, Top Ramen, and Wai Wai became available on the market. While there are some of us who have been curious or brave enough to venture out and try different flavours, some of us still remain unsure about which instant noodles would be worth trying. 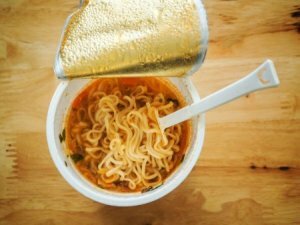 Therefore, in this article, we will discuss how you can choose the best instant noodles for yourself, and also give you a list of the top 10 best ones available online. 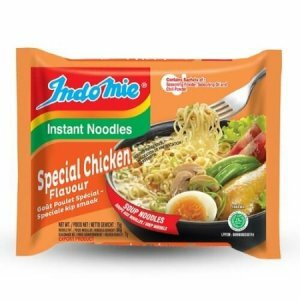 If you’re not too sure about how you can choose the best instant noodles, you should go through the following section to learn about all the things you should remember while buying instant noodles. One of the most basic differences between different types of instant noodles is based on their packaging. The quantity, method of cooking, and the time taken to prepare are all dependent on the way the noodles are packaged – whether they are cup-type noodles or pack-type noodles. Cup-type noodles are one of the easiest foods to prepare because all you need is some hot water. You simply add hot water to the noodles, wait for a couple of minutes, and voilà, you’ve got yourself a meal. These types are great for days when you’re feeling super-lazy, or when you’re camping and do not have any utensils. The only downside to this type is that the quantity is usually less than that of pack-type noodles. If you’re at home, have some time on your hand, and have a large appetite, then we suggest you go for pack-types as these usually have more quantity of noodles. Although you need to use a pot or a pan to cook these types, they end up being cheaper as you get more quantity. However, if you’re not a fan of washing up though, or you simply lack the patience to wait for about 10 minutes, then you probably will not be able to enjoy this type as much. Additionally, you can only have these if you have access to utensils, so they’re better suited for at-home use. The easiest way to judge whether a food product is vegetarian-friendly or not is to look for the green dot. However, if you’ve got slightly more complicated dietary restrictions, or if it’s Navratri time, you should check the list of ingredients to make sure the noodles you’re interested in, are right for you. Let us now reveal our picks for the top 10 best instant noodles you can buy online in India. We hope you’ll discover some new flavours and want to try them out! 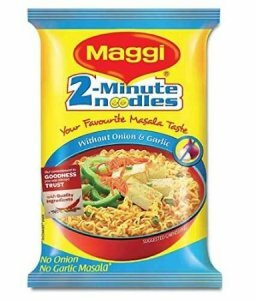 This version of Maggi is specifically aimed at Jains, as well as those fasting for Navratri, as both these groups cannot consume onion or garlic. 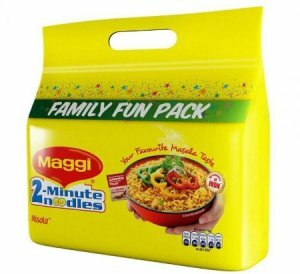 Although those two important ingredients are missing from this product, it still tastes just as good as normal Maggi, so you needn’t worry about having to compromise on the taste. It is really difficult to find this product available though, and even when it is, it is quite expensive compared to the price of ordinary Maggi. Despite the higher cost, the quantity of these instant noodles is slightly lesser than that of normal Maggi, and one pack of these noodles may not be enough to fill you up if you’re really hungry. If you’re going hiking, camping, or on a road trip with some friends, and need enough instant noodles to share with everyone, this is the product for you. You get 2 cups each of the 3 different flavours, and they’re all vegetarian too. They come with a fork inside, so you would only need to arrange hot water to eat these noodles! The amount of noodles you get in each cup is not too much though, so while they’re okay as snacks, you’ll probably need something in addition to these to fill yourself up. Furthermore, these are slightly expensive if you consider the size, and if you’re not a fan of all the flavours, then it might not be worth it for you. 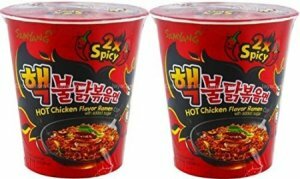 Those who prefer flat noodles, as well as those who want to try instant noodles in a spicy, tomato-based sauce, would like this product. It is completely vegetarian, and its flavour is vaguely similar to Punjabi style curries, which is why it appeals to most Indians. It is slightly spicier than Maggi, so we wouldn’t recommend it for kids, or for those who are weak with spices. 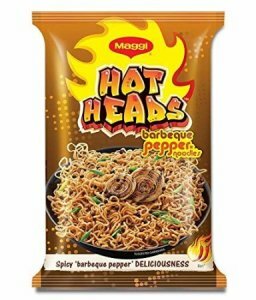 It is also much saucier than Maggi, so if you do not like that, and want your noodles to be drier, then this is probably not the right product for you. These noodles are for those who do find Maggi too dry and wish they had something with a bit more soup. Since they’re not too spicy, they’re okay for kids as well, and one packet of these is really filling, so you won’t feel hungry easily after having these. Although, if you don’t really like soupy noodles or milder flavours, then you probably won’t enjoy eating these. They’re also not the best choice for those who have small appetites as these noodles might be too filling for them. 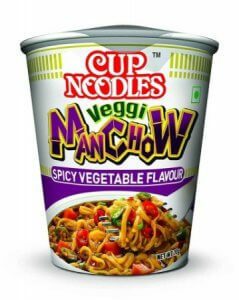 If you’re bored of normal Maggi but are too sceptical of other brands, then these noodles are for you. They are part of a new range of flavours Maggi has come out with; they are vegetarian, and they slightly spicier than ordinary Maggi. They are more expensive though, so you would have to shell out almost double the amount of what you’d pay for normal Maggi. Despite that, the quantity is lesser, and not many will feel full with just one pack of these noodles. Those who want to challenge their spice resistance and want to try something incredibly spicy should go for these noodles. They come with chopsticks, so you won’t need to prepare anything but hot water to have these. Although they’re cup noodles, we recommend having them at home as you might need milk, yoghurt, or the restroom. They are really spicy though, so we would warn all those who are weak with spices to stay away from these. Additionally, these Korean noodles contain chicken, so they’re limited to non-vegetarians. They’re also not the best for regular consumption, because this level of spiciness could potentially upset your stomach. There are not many people who can dislike Punjabi-Style Chinese food, and that’s because the flavours are perfect for North Indian palettes. These vegetarian noodles come with a fork inside, are slightly saucier, and much spicier than Maggi, so they’re good for those who want something spicy to have while they’re travelling. Although, if you’re weak with spices, or looking for cup noodles that are kid-friendly, then these are not for you. They’re also not great for those who like drier noodles, as these are quite saucy. Furthermore, the quantity of noodles you get is not that much, so if you have a big appetite, one of these cups will probably not be enough for you. 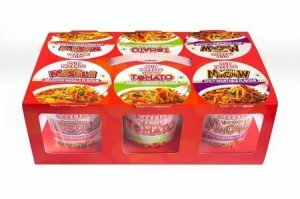 If you’re looking for cup noodles that are flavourful, but at the same time, not too spicy for kids, then these are the ones for you. They’re perfect to take with you while you’re hiking, camping, or travelling, as they come with a fork, so all you would need would be hot water and 4 minutes of patience. 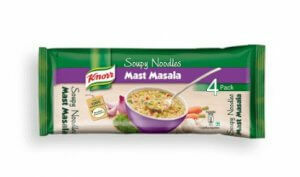 Just like the normal Maggi noodles, these are vegetarian-friendly too, so you needn’t worry about that bit either. 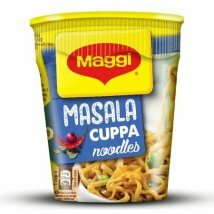 The flavour is also something that most people are accustomed to, so if you’re worried about trying new flavours, then you could just stick to this one for the usual Maggi taste. 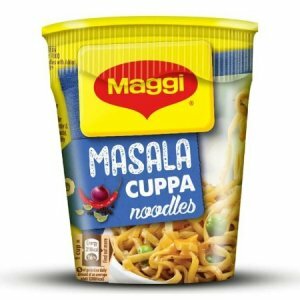 These internationally famous noodles have just entered the Indian market, and are perfect for those who want something new. 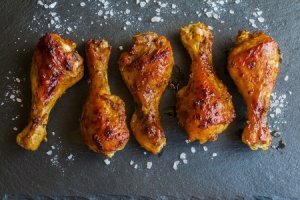 They are slightly soupy, and come with 3 seasonings – first being the chicken seasoning to make the soup, second being the oil to add flavour, and third being the chilli powder to add some kick to your food. They are Indonesian noodles, so they’re also halal, which is why they’re recommended for Muslims who usually cannot find halal noodles. Despite being an import item, they’re extremely affordable as you get 40 packets for about ₹800, which makes the cost of each pack almost the same as that of Maggi chicken noodles. The all-time favourite, Maggi Masala Noodles, are the obvious choice for the number 1 instant noodles. This particular pack contains 8 packs of noodles, which makes it great for those who are planning to stock up for exam season all-nighters. There’s not much explanation needed for the taste as these have the classic Maggi flavour, and they’re vegetarian, so they’re not limited to non-vegetarians either. One of the individual packs is usually enough to satisfy hunger pangs, but if you have a bigger appetite, you can have more than one too. The instant noodle market has grown immensely in the last few years, therefore the variety of noodles has also increased. There was a time where we only had Maggi, but now there’re Indonesian and Korean noodles on the market as well! 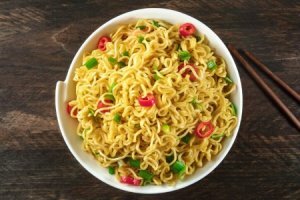 We hope this article helped you understand how you can choose the best instant noodles for yourself, and we also hope our list of top 10 best instant noodles online introduced you to some new and unique flavours that you might not have known before!